Take a walk on the wild side of healthy living and provide your little animals with the nutrients they need. 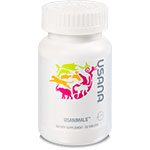 Usanimals supports healthy growth and development with an excellent range of the essential vitamins, minerals, and antioxidants your child needs for healthy immune function, energy levels, bone support, and brain development. * USANA Essentials for Kids.